This post title has a line of lyrics from my song, “More Than You Know.” I was editing that song last week so it could add it to my audio book. 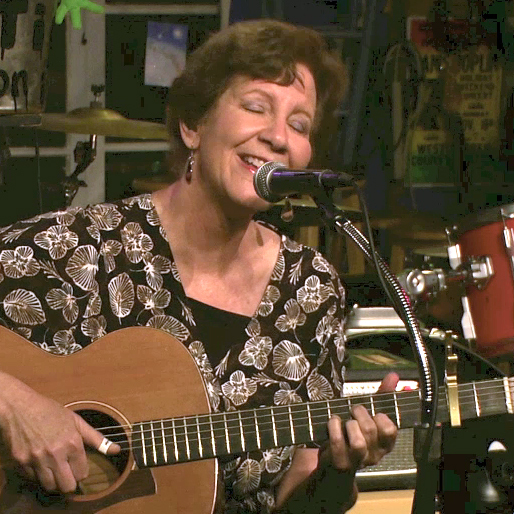 My song is about letting go. I told her how nice it was that she remembered me. And I knew that my smile was the reason. Then I asked her, “Any chance you might have a job available here for my son?” As I left the store, I beamed because she gave me information for him to apply. She said she would consider him and asked me for his name. My 23-year-old son was very discouraged. He graduated college last May and was searching desperately to find a job. He told me he’d be willing to try anything and I wished I could help him more. For certain he wasn’t alone. I had met and heard from many people how difficult it was to find a job. The nursing home was two blocks from the sandwich shop, and I was still singing along to a karaoke of one of songs as I pulled into the parking area. As usual, I thanked God for my music. Staying positive and calm despite my mother’s declining health was important to me. I knew my mother was well cared for by her companion Miriam, but at the same time Miriam couldn’t replace me. Guilt was a cloud that I constantly dodged; I called to check on things consistently but I didn’t devote my life to spending every day with my mother anymore. When she had been in and out of hospitals several years ago, I had. On Wednesday, I usually joined my middle brother and nephew at a nearby restaurant. In the morning, I called my brother and told him that our mom was far too weak to go to a restaurant. I could tell he was worried and very disappointed. The beginning of my awareness that things had turned began today. I realized those outings were over. My mother no longer had the strength to stand, and lifting her into a car would be very difficult. 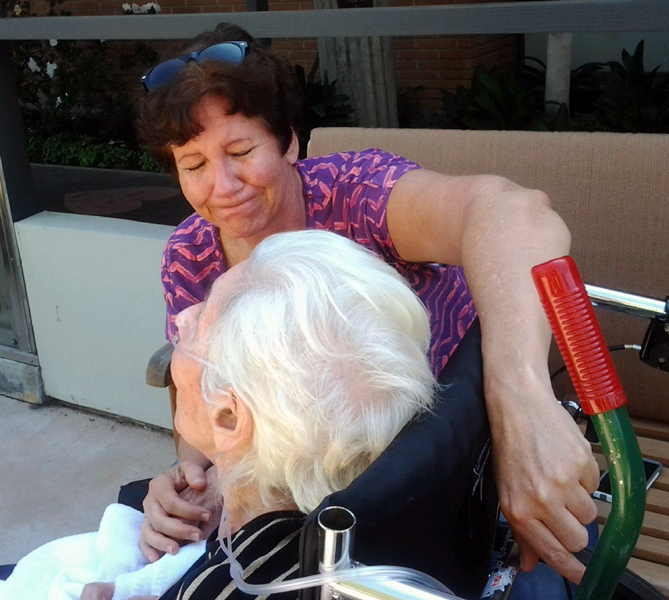 When I walked from my car toward the nursing home, I saw my brother and nephew standing near my mother’s wheelchair. They weren’t going to stay for lunch, but had stopped by for a brief visit. I hugged them both and said perhaps she’d be able to go out with us to our usual restaurant the following week. With those words, I was lying. Miriam had sent me a picture of my mother sitting outside the day before. It came with the beautiful message that my mother was enjoying the sunshine. I shared the picture with family and friends and even attached it to the last story I wrote about my mother and her struggles. But the truth was that I didn’t really look closely at the photo of her bathed in sunlight. I hadn’t really noticed how my mother’s mouth was wide open. It looked like a smile, but it was actually her attempt to breathe any air she could. As soon as my brother and nephew left, realizations of my mother’s situation began to set in. I was horrified to see her this way. Her jaw was receding as she gasped to breathe. She was skeletal. During my last few visits with her, she had been sleeping and her eyes were closed. Now they were wide open. It was hard to look at my mother as she studied me intently and rattled with every breath she took. Miriam and I found a table in the shade where we could eat our lunch. I was so happy to see Miriam and she felt the same way. But I felt tears continually oozing out; I quickly wiped them away. My eyes were foggy and my smile felt forced. Miriam went to get my mother’s lunch and bring her tray outside to our area. 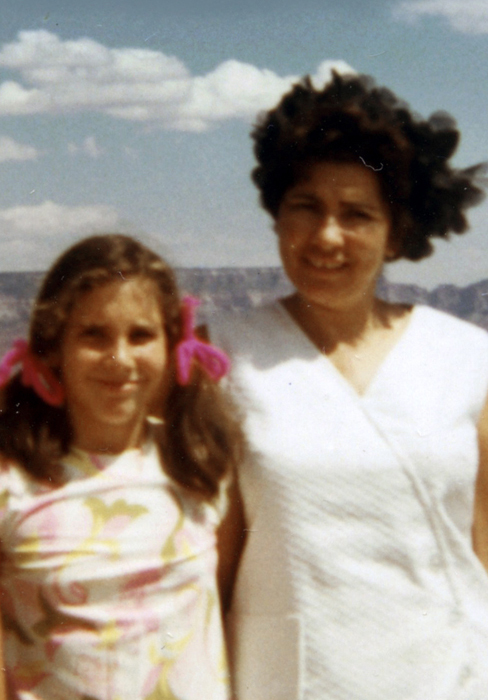 As soon as Miriam walked away, I bent close to my mother’s face. I clutched her hands and they were soft and warm. It was just the two of us. But we were not really alone. I felt the presence of death and so did my mother. I put my head against her cheek and she slowly mouthed a kiss upon me. I began to cry. I told my mother how sorry I was that I couldn’t find a way for my brothers to reconcile so she could see us all together. So many times I had promised her it would happen. Miriam returned and became very emotional watching us. Suddenly my mother croaked, “I sure did!” I felt my heart pound and was amazed – she was aware of what I had said! But then she began to cough and choke from the effort of speaking. This picture was taken a few months ago. We had finished our lunch and I told Miriam it was a little too cool in the shade. I thought it would be nice to take my mom over to the garden area where it was sunnier. I didn’t tell her that whenever I looked at my scar, I was reminded of all the years that I had carried breakfast upstairs to my husband on the weekends. I dreamed that someday I would experience having someone do that for me. 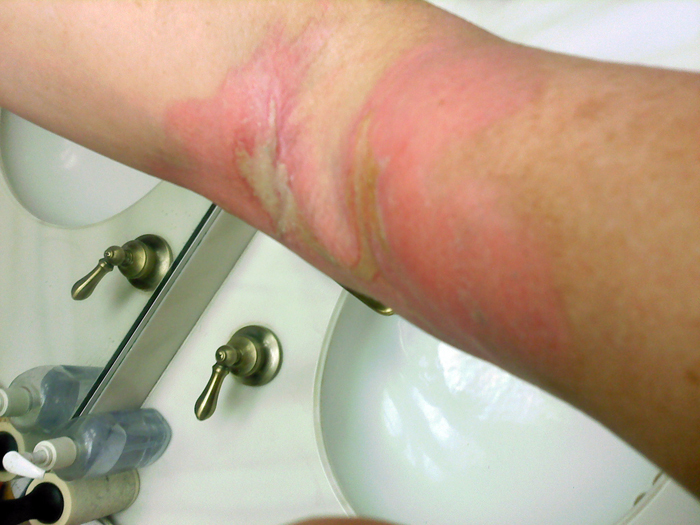 I burned my arm two years ago when hot tea spilled on me. I was carrying a tray with breakfast on it for my husband. Suddenly, I was thinking of what I could write related to what I saw in my mother’s eyes. I finally allowed myself to look into her eyes. It was quite difficult because I was gripped by emotion that ripped my heart open. 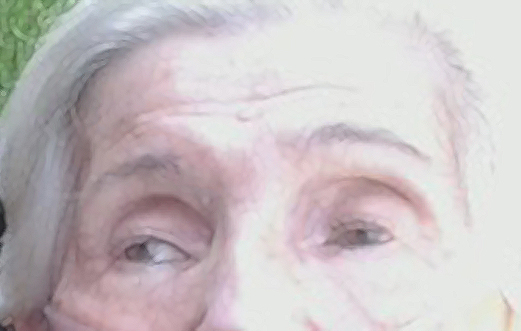 My mother’s left eye was blind from macular and the other was hooded and drooping. Her eyelashes were moist and clumped. Both her eyes were filled with deep love. But my heart ached because I saw so much sadness. She knew death was approaching. First, I told her how much I loved her. Then I let her know I’d be okay and told her how strong I was. Relieving her of worry would help her to let go; it was just like when I helped my father to die but in a different way. 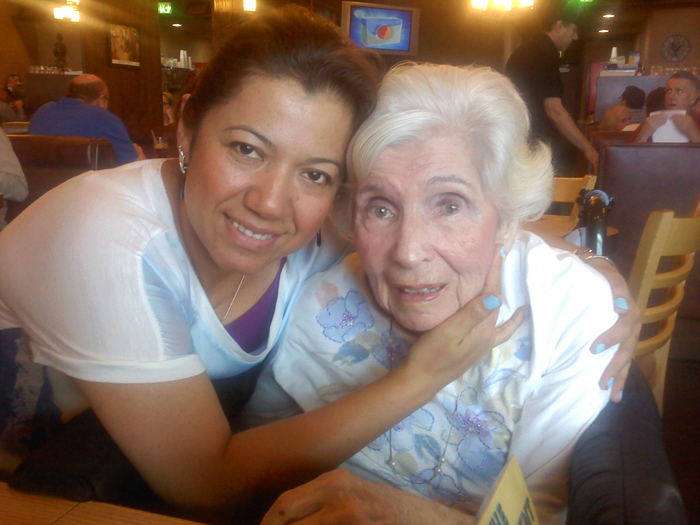 I said, “Mom, I’m so lucky to have Miriam; she’ll always be a part of my life now. 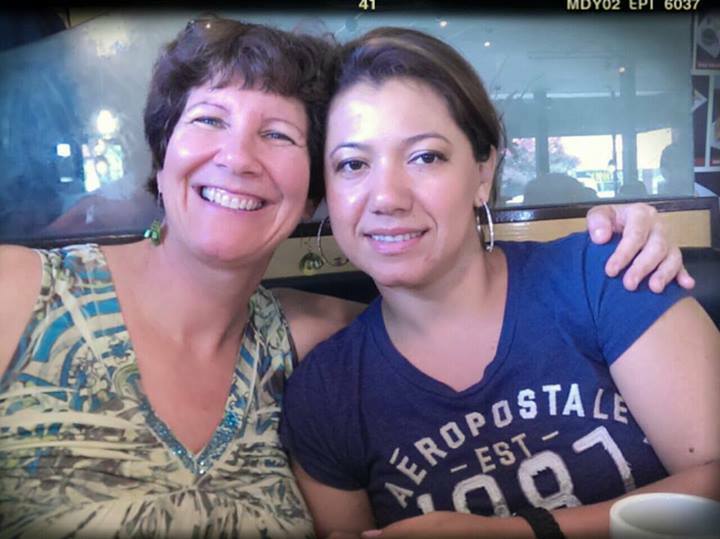 I’ve made a wonderful new friend because of you!” Miriam hugged me. I wondered if my mother were still fearful about dying. She often told me that it terrified her. I was thankful that I didn’t see fear, only sadness. Her eyes held resignation. I believed that it was because she didn’t want to leave. She loved all of her children so much. Then I turned to my mother and said, “I’ll always remember how we rode bikes together. And how I dragged you through Costco with your walker. You loved it and never complained even when your back was hurting.” I found my smile for that moment. 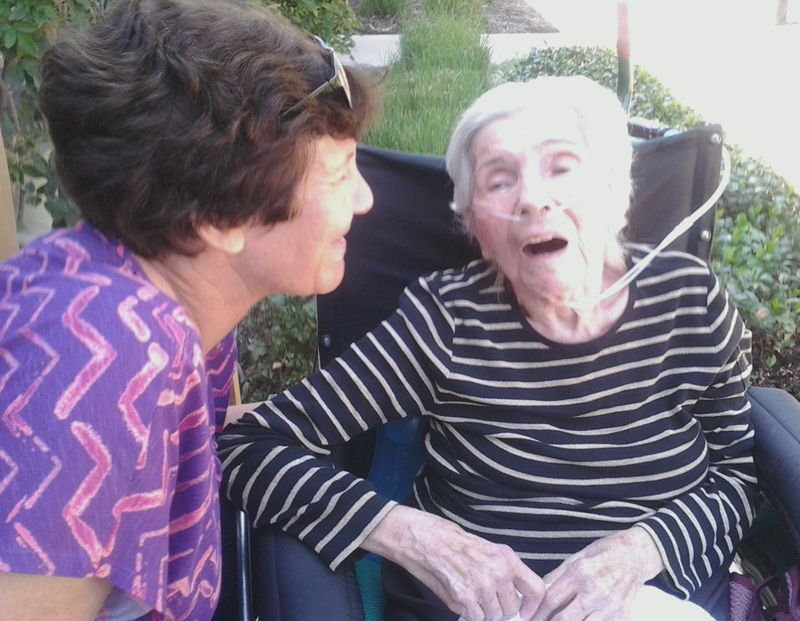 Miriam said, “Judy, you know she lives for moments like this with you. It’s so beautiful!” Miriam began to cry. For over an hour I chattered on about my life hoping she was able to understand what I talked about. I spoke to her just like I used to before dementia stole her awareness. 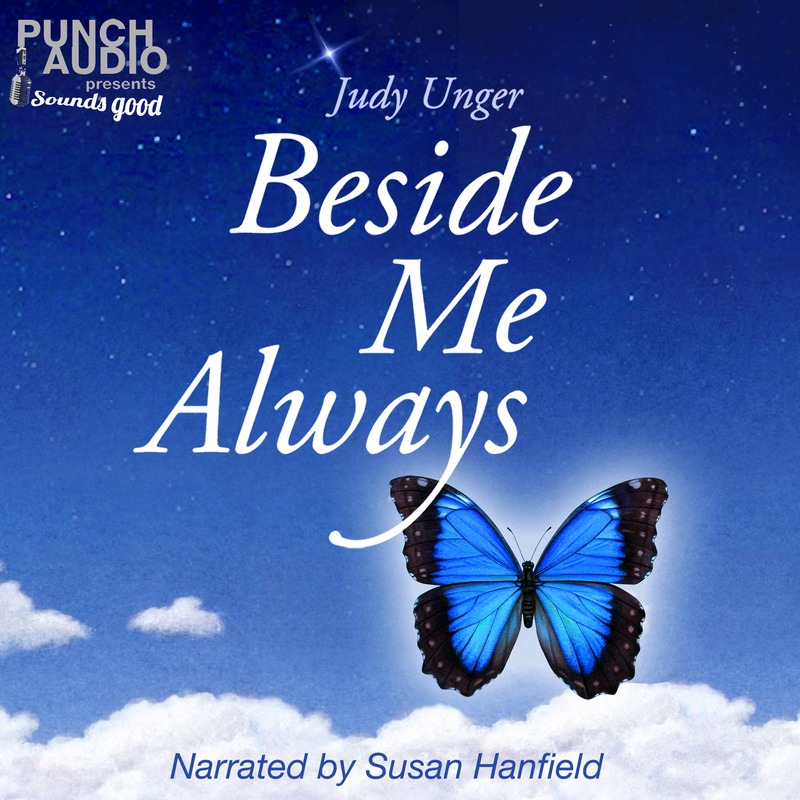 When dementia left her mute, I often wondered if she was understood the conversations that went on around her. It was almost like she was invisible. For such a long time, I didn’t know what to say to her so I said very little. It was far easier to talk to Miriam. But now it was different. The time was ticking loudly and every moment was elevated. Because I knew how much she appreciated my words, I allowed myself to open up more. Now my mother heard all of my reasons for getting divorced. I told her how wonderful her grandchildren were. And how every time I was in the kitchen, I felt her presence. I loved sleeping in the bedroom where she and dad had slept for over forty years. I let her know how much I loved living in the home I was raised in. Eventually, it was time for me to go. I couldn’t believe I said something so needy! A tank of oxygen was connected to her. When she coughed, I imagined she was drowning. And there was nothing I could do to stop it. I looked again into my mother’s eyes. They were unblinking and resigned. She was very still for a moment. I found myself imagining that she had taken her last breath and all of this was over. Her will to live was unbelievable. But death wasn’t something she could overcome, despite her will. It was hard for me to leave her and I cried as I said goodbye. I staggered to my car gasping. Waves of tears engulfed me. I wondered as I drove home how I would keep smiling. This entry was posted in Uncategorized and tagged acceptance of loss, acoustic guitar, Aging Parents, Caregiving, composing, death, dementia, grief, GRIEF RELATED, guitar, inspiration, letting go, losing a mother, loss, loss of a mom, love for a mother, love never dies, lovesong, lyric development, lyric writing, lyrics, Miriam, More Than You Know, mother, mother and sadness, mother daughter relationship, mother dying, mother with dementia, mother's illness, Mother's love, Music, Ordinary Life, original songs, singing, songwriting, tribute to my mother, writing. Bookmark the permalink. Oh, Judy, how sad it must be to see your mother changing and leaving you this way. How wonderful that you have such good memories of her and of your times in better days. I believe even when someone is locked they know we are there. Maybe not the same as you or I, but on a different internal level. If not the words then your voice, your touch and that smile.